Yoga can get you going in the morning and help you slow down at night. In fact, a Harvard study found that people who practice yoga consistently for just eight weeks slept better than those who didn’t practice. Certified yoga instructor and Sun Basket’s marketing copywriter, Jenny Fant takes us through some mellow moves to prepare your body and mind for a good night’s sleep. 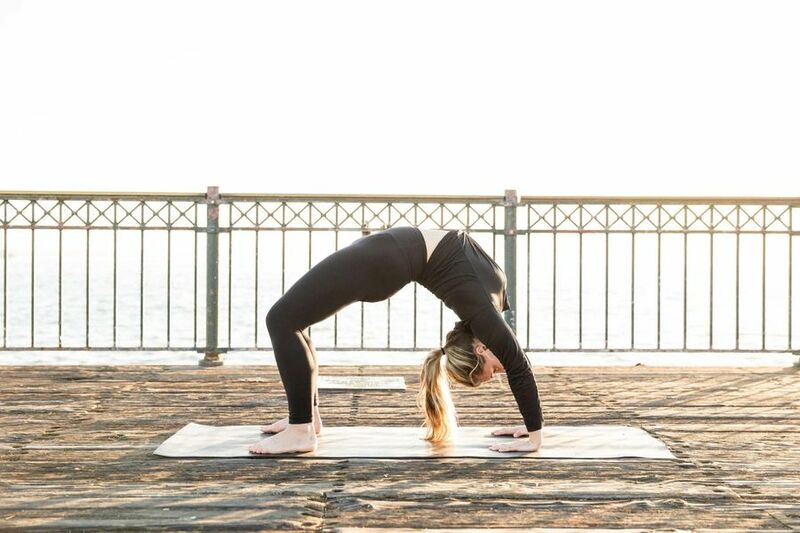 After a few stretches to let go of tightness, try some twists to send new blood to fatigued muscles and organs, and inversions to give your heart a break and reverse the stresses on your body, you’ll be ready for a night of solid shut-eye. Seated forward fold: Sit with your legs stretched out directly in front of you, reach up and THEN over with your upper body and extended arms. Think about lengthening your torso rather than crunching your abs. Head to knee: While still seated, hold onto your feet, ankles, or outer calves, and use your biceps to pull your head closer to your knees, lengthening as you stretch. If that feels like too much, just let gravity do its thing while you chill out and hang there. Butterfly: Return to an upright seated position and press the soles of your feet into one another, letting your knees butterfly out to either side. Pull your belly button into your spine and sit tall. Reclined butterfly: Keeping your feet in place, slowly lie on your back. Place one hand on your heart and one hand on your belly and chill here for a few breaths. Bridge: Set your feet parallel, about hips’ width apart. Pressing your feet into the ground, use your legs to lift your back (try to relax your booty). 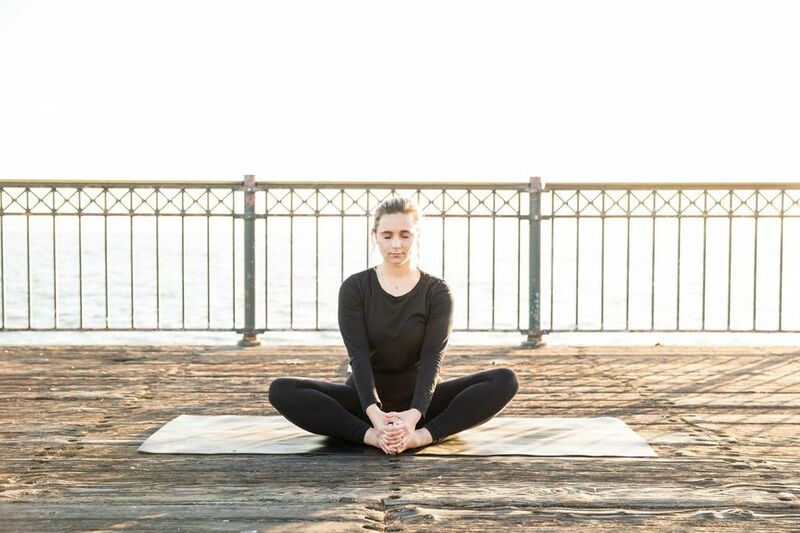 Lay your shoulders and arms parallel on either side of your body to support you in the pose, or clasp your hands on the floor below your tailbone. Hold here for two to five full cycles of breath. Wheel: With your feet still parallel, and pressed into the mat, put your palms on the mat next to your ears, with your fingers pointing towards your feet and your wrist towards the top of your head and push up from your biceps. Keep your feet as parallel as possible. Hold for two to three full cycles of breath. Plow: Come down to your back, reset with some calming breaths. From here, lift your hips up and out of your torso and let your legs follow up and over toward (or perhaps even past) your head. Keep your feet engaged (either flexed or pointed). Legs up the wall: If you only do one pose at night, DO THIS! Sit on the floor sideways against a wall. Gently turn your body, laying your back on the floor and bringing your legs up the wall. Lay close to the wall so that your legs are supported perpendicular to your reclined torso. If a pillow or block feels good right under the hips, add that for support. This passive inversion helps change the flow of blood and can help reduce anxiety, stress, and insomnia. Stay in the pose for five to 15 minutes. Supine twist: Start on your back, with your legs extended and your arms beside you. Slowly draw your right bent knee into your chest and then over towards your left side body. Keep both shoulders both firm to the mat, lessen your twist if necessary. Repeat on the opposite side. Corpse pose: Come onto your back, let arms and legs fall into a comfortable position and close your eyes. Some call this the hardest yoga pose of all. Zonk out in any position that feels most fitting: a block or blanket under your sacrum or behind the heart might feel nice as well. Relax your breathing, try not to move at all for one to five minutes. Allow yourself to become aware of where your thoughts are moving. Are you falling asleep? Are you thinking of tomorrow’s to-do list? Without self-judgment, use this time to observe where your mind wants to go when you ask it to be still.